Zaha Hadid is known for her emphasis on curves to capture a building's fluidity and its integration into its natural surroundings. The first woman recipient of the Pritzker, Zaha Hadid, has always pushed the boundaries of architecture with her bold works that draw inspiration from a very Chinese concept - harmony. Yu Tianyu reports. British-Iraqi architect Zaha Hadid has always defied the critics. Her unconventional designs invariably get the skeptics wondering whether they will ever see the light of day, only to be proven wrong. 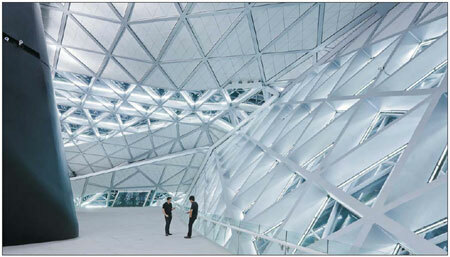 Hadid's first Chinese project, the Guangzhou Opera House, with its "twin boulder" design, bears her signature style. Standing on the banks of the Pearl River, the structure that cost 1.38 billion yuan ($202 million) and took five years to complete, was unveiled in May, 2010. The Pritzker Prize-winning architect - the first woman to be honored with this "Nobel Prize in architecture" - says, "The Guangzhou Opera House project is a landmark of my architectural career, while my experiences in China since the 1980s have also been seminal to my art creation." Hadid's first trip to China happened three decades ago when the country had just started opening its doors to the outside world. "China in the 1980s and now are just two different worlds. At that time, the most striking thing was its uniformity - everyone wore a Mao suit. There were very few cars on the street and new buildings were almost all the same," she recalls. But even then what struck her was the many parks and gardens dotting the nation, and their harmonious integration of the many elements of nature. Referring to the disappearance of much of traditional Chinese culture in cities such as Beijing and Shanghai, she says: "It happens everywhere, when a historical city is being transformed as a world metropolis, but you need to find a balance." This balance can be achieved by using traditional ideas or construction materials in new buildings, says the architect with a formidable body of work to her credit. But it shouldn't look imposed, the trick is to find a harmony, she adds. "We can still preserve some original historical sites as memorials or museums while building new ones." Hadid's China interests include a performing space in Chengdu and another three projects in Beijing and in Shanghai for SOHO China Ltd, a private real-estate developer known for its high-end apartments. Commenting on her design sketches that provoke mass discussion about their feasibility, she says: "Construction is never easy and (the inclusion of) curves or inclines are always (an exercise in) experimentation." Following the successful completion of the Birds' Nest and Water Cube, the nation is ready for more creative architecture, she says. Hadid was born in Iraq in 1950, a time when Modernism stood for glamour and progressive thinking in the Middle East. She found her calling in life when she was just 11, delighting her parents by designing her own bedroom. "I experimented with new shapes in my early works after researching new engineering concepts to understand all possible scenarios that a building could cope with," says Hadid, who earned a degree in mathematics, before moving on to study at the Architectural Association in London. Her early style was all about fragmentation, with straight lines and folds, posing a major challenge to the design's translation into reality. The Lois & Richard Rosenthal Center for Contemporary Art in Cincinnati, United States, completed in 2003, and her first commission in the United States, is a prime example of this style with its new spatial concepts and bold, visionary forms with many vertical angles. Her later works put more emphasis on curves to capture a building's fluidity and its integration into its natural surroundings. The Guangzhou Opera House is an excellent demonstration of Hadid's quest for this fluidity and integration. "Many people say my works are too complicated. 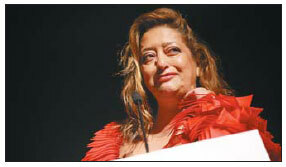 But it is similar to nature which is also complex," Hadid says. "But there is also order and organization in nature, just like in my works." Her futuristic style has spawned many copycats. She says: "This is the best time for vanguard architectural works. "Architecture is not just about attracting attention or being entertaining; it is about sustainability and a better life."